I got some messages on Ubuntu Forums on how about installing Ubuntu on the Samsung 5 and especially the model NP530U3C-A07. I make this guide to help whoever else gets into this problem as the installation is not as straightforward as it may seems. The Samsung NP530U3C-A07 and some others don't use hybrid hard discs. What they have is a normal HDD and then a very small SSD of about 4 to 30GB. Both of them are seen as separate devices so it's easy to distinguish which is which by their size. Choose and format the bigger disk (HDD) to as many partitions you want. I format mine as a big ext4 to just store media. The thing to pay attention to is to not reformat this drive in the future as that would probably screw up the bootloader. That happened to me. On "Device for bootloader installation:" choose the HDD. It doesn't matter if you choose the device itself or the partition on it. Not everything works out of the box but luckily for us there are things that can fix most of them. Bellow are several fixes for different problems. I haven't fixed this but a workaround is to manually set a default brightness value for every restart. You can do that by automatically editing the /sys/class/backlight/acpi_video0/brightness on every boot. For that we add a line on /etc/rc.local a file that runs on every boot of the OS. Add echo 31 > /sys/class/backlight/acpi_video0/brightness to the file /etc/rc.local just before line "exit 0"
Probably your hard disc isn't mounting automatically on bootup as it doesn't have any system files. For this we need to edit the fstab file and set the HDD to be mounted automatically on system startup. If you use the directories Downloads, Movies, etc. in your home directory it should be wise to make shortcuts for them so they point to the hard disc. There are two major reasons for this. First of all, media files are not going to be "faster" if they are on the SSD so why sacrifice space by using the ultra small SSD and not the huge HDD? Something else to consider is that SSD drives have a specific number of write cycles before they die. Therefore it's good to have all kind of files that are going to be written/rewritten all the time, on a HDD. Symbolic links are the same thing as shortcuts in Windows. They are just files that point to an other place, in our case the hard disc. ls -l | egrep "^l"
That shows all symbolic links in current directory. It's still me Ambesa64. My computer crashed when partitioning and I had to send it back to samsung. Now that it is back I started trying to install Ubuntu 12.10. I've followed carefully your suggestions but I stopped when it came to installing ubuntu on the SSD as you suggest. My ssd seems to be partitioned into two: one of 6,00 GB and a second of 16.24 GB. I tried to understand if they are both fully but I'm not sure, because checking with the built-in partition manager they seem to be completely full when with EaseUs partition they seems to be empty. My worry is that the SSd is fully used by WIN 8, and as I'm scared of having a second crash by screwing Win 8, I'm back again to ask for your kind suggestions. Shall I install ubuntu 12,10 on one of the two SSd partitions (then which one) or I better install it on the 500 GB hard disk? But isn't the HDD a hybrid one that manages the SSD cache on it's own and messing with it is unnecessary complication? 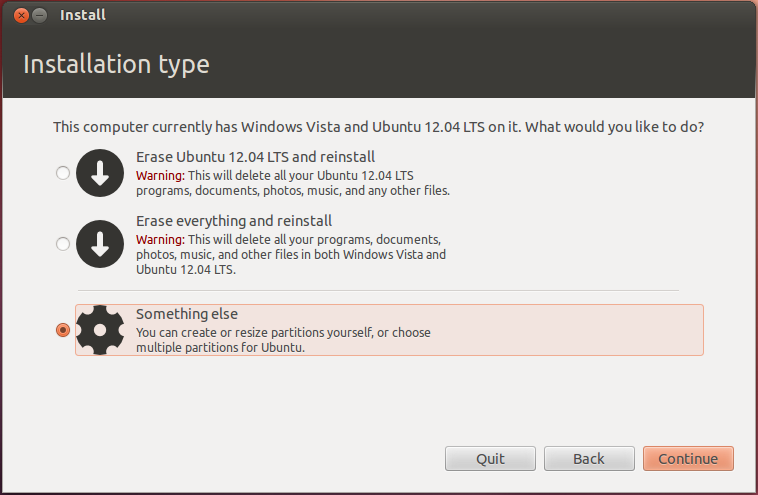 If you have a hybrid hard disc then Linux sees it probably as one partition, thus you can't screw it up. The disk on the Samsung is not a hybrid(at least the one I have). It is a seperate hard disc and a seperate memory card(SSD) glued on the motherboard. Sorry, I didn't read your message earlier. If you still have a problem just take a picture, upload it somewhere and send the link here or you can send it from Ubuntu forums. I am not sure which "build-in partitioner" you mean. You mean the one used when installing Ubuntu? Windows 8 uses both hard discs yes. That's why you can't use the SSD with Windows if you are going to dual boot. You either will install ONLY linux, or you will install both Linux and Windows but Windows will not make use of the SSD. For the latter you should make a partition on the HHD and install Windows there. Then you should do as I say in this guide. So in the end you get Linux on the SSD and Windows on the HDD. Thanks for the comments on keeping monitor brightness! have a new series 5, hdd crashed, got a new seagate hybrid 8gh ssd/1tb hdd. I tried everything, but when the laptop loads ubuntu (whether trial or install) and the little bubbles are going under the ubuntu logo,, the screen goes all weird and blocky and gets stuck. Can you run Ubuntu live? If I were you, I would disconnect the HHD totally and see if I can start Ubuntu in live mode. If it doesn't work, then try putting Ubuntu in a different USB stick. You should be able and boot from Windows just as you booted from Linux. Maybe the Windows image in the USB stick is corrupt. Try booting from a different computer. If it works, it means that it's a BIOS setting on your laptop that is incorrect. Also make sure that you don't stick the USB stick in a USB3 port. Yes, you are right, the image in the USB stick was currupted, but now I fixed it, and all runs fine. Thank you for this page, especially for the screen brightness tip. I love using linux, and I have been free from windows for some time. However, my favorite machine couldn't remember screen brightness settings, and I found it annoying to have to set it manually after every startup. Now it remembers!